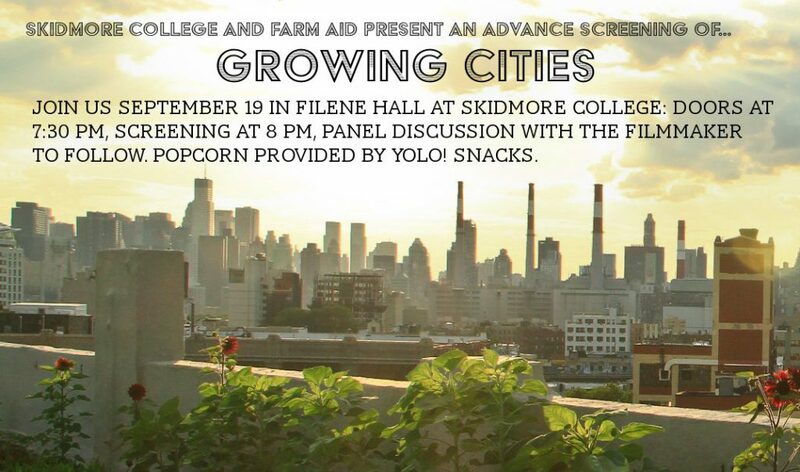 Farm Aid and Skidmore College present Growing Cities, a new documentary about urban farming. Join us for an advanced screening (doors at 7:30pm, film at 8pm), followed by a panel discussion featuring the filmmaker. Popcorn will be provided by Yolo! Snacks. Free parking is available in Skidmore’s Arts Quad Lots A and B. Lot A directions: From Skidmore’s main entrance, take a left onto Perimeter Road, then a right into lot A, near the Arthur Zankel Music Center. Lot B directions: From the main entrance, continue straight across the intersection. Lot B will be on your right. If you can’t make it, view the trailer or catch another upcoming screening.